Christmas isn’t the only holiday that brings good cheer and marketing opportunities. Easter takes place as spring is arriving. People are eager to celebrate the end of a long winter – and that means opportunity for you. Need some ideas? Here are email marketing tips to kick-start your Easter marketing campaign. Some products are easy to promote around the Easter holidays. If you sell clothing, show people how to update their wardrobe for spring, and offer a discount on all floral-themed apparel. Many readers purchase a new outfit to wear on Easter Sunday. Show them what you have to offer before they make a trip to the mall. Flowers, toys for kids and candy are other easy products to promote around Easter, but you can give almost any item an Easter or spring twist. If you sell home products, show customers how to update their home for spring or the Easter holidays using your products. Give them five ways to decorate a table for Easter dinner. Easter and spring is a time of renewal, and people are open to new ideas. If you sell beauty products, send an article discussing ten ways to update a look for spring with links to your products. If you’re in the travel business, give readers five ideas for places they can spend Easter weekend while getting a special spring discount. If you sell pet products, show pet parents how to make an Easter basket for their four-legged friends, using your products, of course. Get your customers in a cheerful mood by using a themed email template, but be cautious when using an Easter theme unless you know your audience. Easter has religious connotations, and sending emails on an Easter template may be offensive to some readers. To play it safe, choose a colorful spring theme with flowers, trees and birds instead. You’ll still lift your readers’ spirits and put them in a receptive frame of mind. If you market to a primarily Christian audience, pull out all the stops with an email template featuring baskets full of colorful eggs and the Easter bunny carrying a basket full of savings. If you are looking for some colorful Easter email templates, check out this free template pack to use with SendBlaster. The package includes 10 original free HTML templates, fully customizable and compatible with all major email clients. In a split test carried out by Blue Fly, animated emails pulled in 12% greater revenues that non-animated ones. Use an animated Easter or spring GIF in your emails to catch readers’ eyes and encourage them to keep reading. Make it worth their while by offering special savings for Easter or spring-themed merchandise. Don’t go overboard. A single animation usually works best. Too much movement can be distracting and cause readers to hit the delete button. Easter coincides with spring, and it’s a time of new beginnings. Get your readers in the mood with colorful email templates with an Easter or springtime theme. 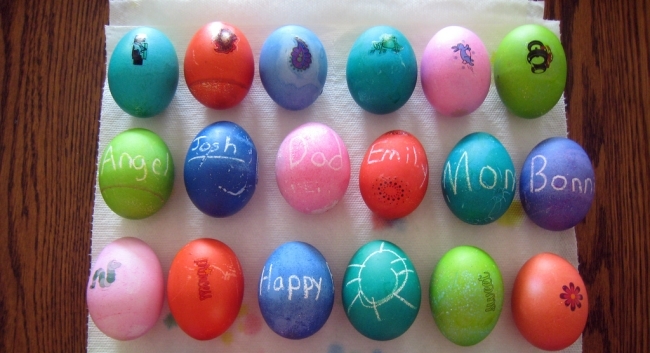 Then give them ideas for making the Easter and spring even better using the products you offer. Keep your Easter email marketing as light and sunny as springtime itself to lift your readers’ spirits and encourage them to click-through to see what you have to offer.